Chosen by Food52.com as one of the 16 best cookbooks of 2012, Little Flower showcases the most beloved dishes at Christine Moore's Little Flower cafe in Los Angeles. Her food is artfully simple and powerfully flavorful, and each recipe is accompanied with a vivid full-page photo. The collection focuses on breakfast, lunch, simple supper, and her acclaimed desserts. 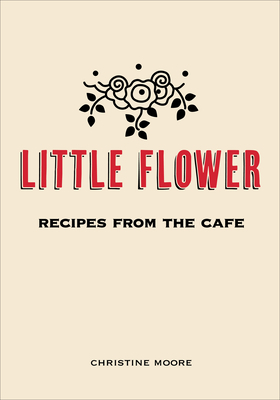 Celebrated by the Wall Street Journal, Los Angeles Times, and David Lebovitz's Sweet Life in Paris, Little Flower: Recipes from the Cafe makes it possible (and easy) for home cooks to create Moore's Lemon Lentil Soup, Goddess Salad, Buttermilk Pretzel Rolls, Chocolate Caramel Thumbprint Tartlets, and her famed Brown Butter Shortbread, as well as fluffy quiches, vibrant salads, elegant sandwiches, and much more. Christine Moore: Christine Moore is the chef/owner at Little Flower, a cafe and candy-making kitchen in Pasadena, CA.Ryan Miller: Ryan Miller is a food and lifestyle photographer in Los Angeles.